Officer in the War of 1812. Mortally wounded in Canada, 1814. Forsyth County named for him. Home stood a few feet north of this spot. Location. 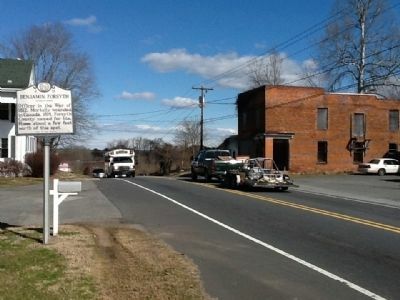 36° 15.71′ N, 80° 13.93′ W. Marker is in Germanton, North Carolina, in Stokes County. Marker is on State Highway 8 & 65 0.2 miles south of South Friendship Road, on the left when traveling north. Touch for map. 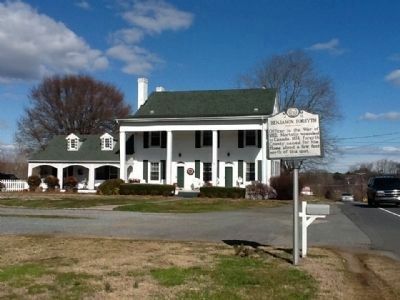 Marker is in this post office area: Germanton NC 27019, United States of America. Touch for directions. (approx. 5.6 miles away); Bethania Freedman's Community (approx. 6.3 miles away); Cedar Grove School (approx. 7.8 miles away); Ogburn Station (approx. 7.8 miles away). 2. Wikipedia Entry. 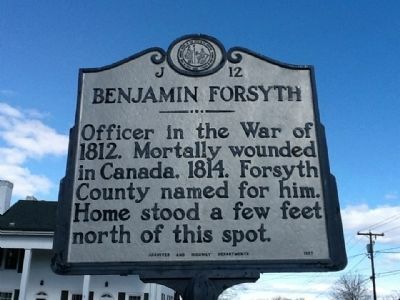 “Later in , Forsyth (now a major) and his men took part in the campaign aimed at capturing Montreal, but were not present at the Battle of Crysler’s Farm. Forsyth was promoted to brevet Lieutenant Colonel the following winter. He was active in skirmishing and patrolling north of Lake Champlain in the late spring and summer and was killed in June 1814 in a clash at Odelltown. Though it is "a few feet north" of the marker, it is unclear whether or not the house behind marker was Forsyth's. 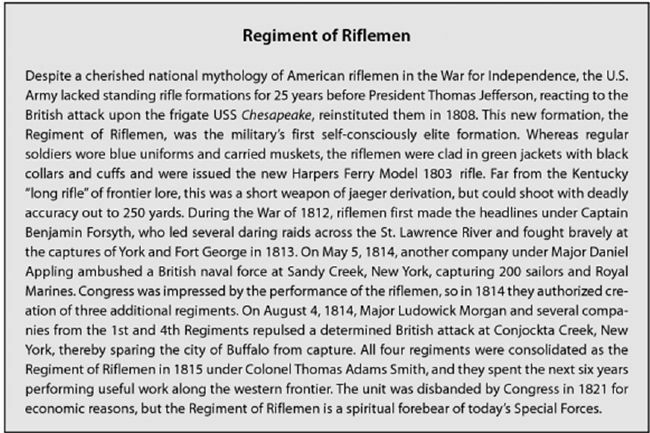 Forsyth was commissioned a lieutenant in the U.S. Regiment of Riflemen when it was formed in 1808. At the start of the War of 1812, he was a Captain and Company Commander. More. Search the internet for Benjamin Forsyth. Credits. This page was last revised on June 16, 2016. This page originally submitted on February 12, 2012, by Michael C. Wilcox of Winston-Salem, North Carolina. This page has been viewed 527 times since then and 5 times this year. Photos: 1, 2, 3. submitted on February 12, 2012, by Michael C. Wilcox of Winston-Salem, North Carolina. 4. submitted on April 26, 2012, by Russ Grimm of Hampton, Virginia. • Craig Swain was the editor who published this page.